A frequent target of caricaturists was the folly of fashion. Because clothing and apparel were so visual, and often quite extreme, British attire lent itself to satire. In the following three prints, James Gillray and George Cruikshank connect uncomfortable female fashions to painful medical conditions. In two prints, ill-fitting shoes cause painful and protruding corns. 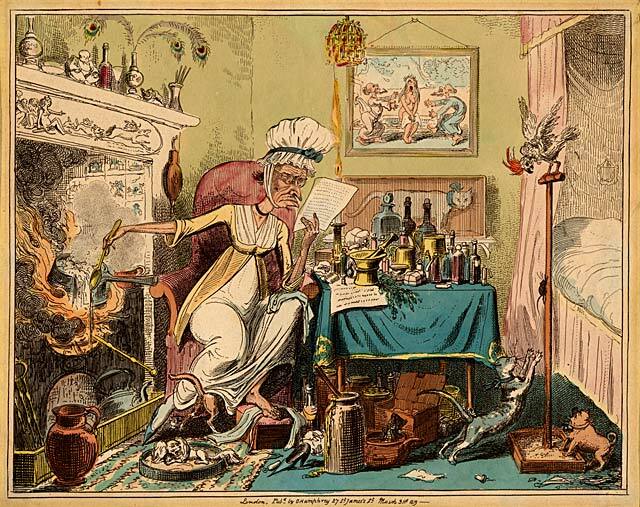 To satirize the effort to achieve a small waistline, Cruikshank links the tightening of the corset to the medical condition of colic. In classic caricature form, both artists grossly exaggerate the facial features, the medical aliments, and the lengths the sufferers went to find relief. Comfort to the Corns. James Gillray, published by H. Humphrey, 27 St. James’s Street, February 6, 1800. 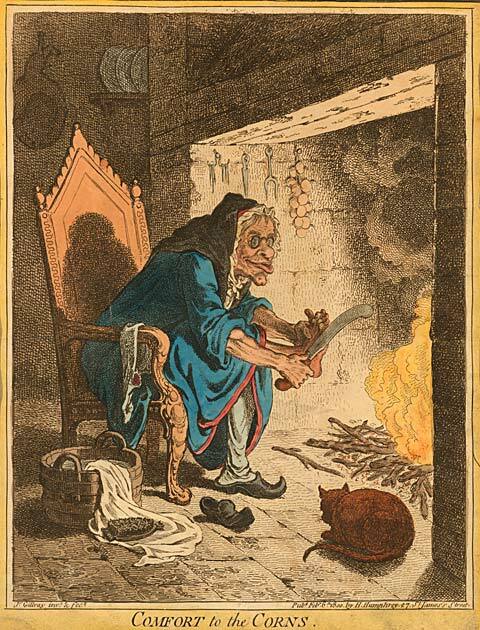 In this caricature, James Gillray depicts a grotesquely unattractive woman seeking relief for her aching feet. Poorly fitting shoes commonly cause corns. At the time of this caricature, shoes were not made specifically to fit the right foot or left foot; they were interchangeable. In Gillray’s etching the woman’s pointed shoes appear to be much smaller than her actual feet. To remove the offensive and painful protrusions, the woman prepares to hack her corns off with a giant knife. Mixing a Recipe for Corns. George Cruikshank, published by George Humphrey, 27 St. James’s St., March 31, 1819. In this intricately detailed caricature, Cruikshank’s character also suffers from extremely painful corns. She has removed her shoe from her left foot to reveal large calluses on her toes. Her pointed, high-heeled shoe on the floor appears to be much smaller than her foot, a definite commentary by the artist on the foolishness of fashionable footwear. To solve her medical problem, the woman resorts to self-medication. There are numerous bottles, herbs, as well as a mortar and pestle on the table, and all sorts of jars and jugs strewn on the floor. She holds a recipe up close to her face with one hand, while stirring an angry, bubbling, burning concoction in the fireplace with her other hand. The Cholic. George Cruikshank, published by G. Humphrey, 27 St. James’s St., February 12, 1819. 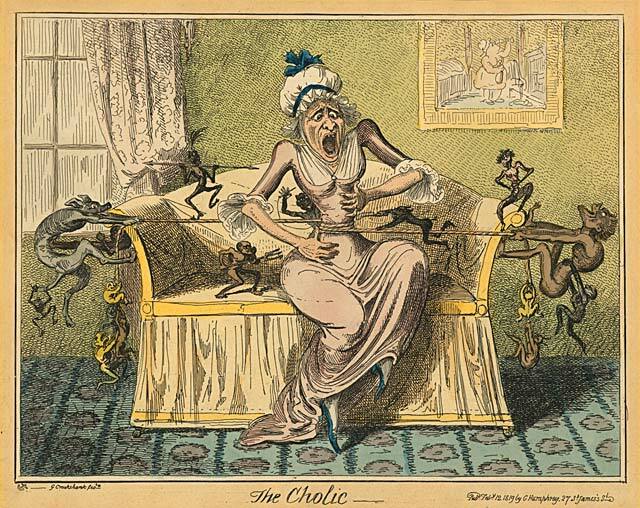 George Cruikshank satirizes the abuse that women experienced by being held hostage to the fashions of the day in this entertaining print entitled, “The Cholic.” Colic is a medical term for severe abdominal pain, represented in the caricature by the tightening of a rope around the woman’s waist. The irony is that her agony is self-imposed and not caused by a preexisting medical condition. The woman is a victim to the popular practice of wearing tight-laced corsets. The woman screams in pain as many imps pull and tug on the rope in order to get her waist to be as tiny as possible. Another creature holds a needle and thread as he sews up the back of her dress. Three others threaten the woman with various weapons: a pitchfork, a spear, and a knife.